This years holiday treat ! 8 oz Graham Cracker Crumbs – I buy crumbs that are pre ground in the baking aisle. In a small bowl , combine all ingredients and press into a greased cheesecake pan. Press crumbs into pan using a flat bottomed glass. It will help you get a uniform crust. Crust will go all the way up sides of pan , its a deep cheesecake. Be mindful not to over mix these ingredients. Take time to scrape down sides and the bottom of mixing bowl with a rubber spatula often , making sure to mix all of the cream cheese into the batter. Beat Cream Cheese . Add Sugar , Flour, Zests. Add Eggs and Yolks in small increments until all is combined. Add Vanilla. Mix until combined. Pour Cream Cheese mixture into baked crust . Place cheesecake pan onto a cookie sheet incase of spillage during the baking process. Bake for 1 hour or until wooden skewer or toothpick comes out clean. You may need another 10 minutes depending on the heat of your oven. If top gets too brown loosely lay a piece of foil onto the browned top. Let cool completely before removing the spring pan. In a saucepan , combine all ingredients. Heat to a boil, cook for 2 more minutes. Cool. 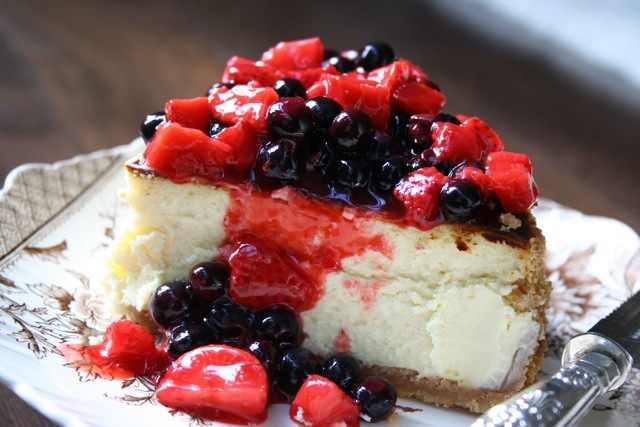 Slice Cheesecake, pour berries over top and enjoy . This entry was posted on Friday, November 23rd, 2012 at 9:50 am	and tagged with berry topping, Cheesecake, desert, East Coast, fresh berry, new york, recipe and posted in Category. You can follow any responses to this entry through the RSS 2.0 feed. up for the great info you might have right here on this post.